“Strategic gifting”- Bev Barnfather used the phrase when she introduced herself recently and it piqued my interest. 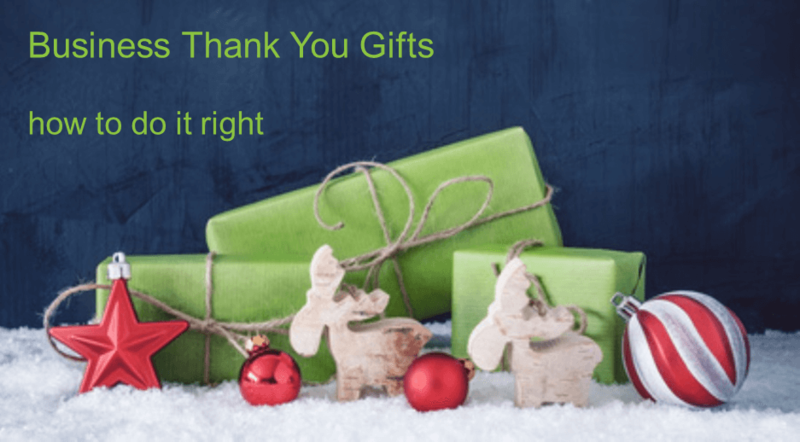 I caught up with her to find out more about the effective use of business thank-you gifts. Bev identified three key mistakes people make with their gifts. How many of these apply to you? Do you just give a “stand alone” bottle of wine to everyone without giving it much thought? Your clients may be non-drinkers or their religion may not allow alcohol. Adding a “use, keep and display” item ensures visibility and ongoing marketing benefit. Giving a gift is an opportunity to start a conversation and enhance a business relationship. Bev leads by example and personally visits her top clients with her thank you gifts, sits down for a chat and asks for feedback. This way she is able to learn more about their needs and concerns. Wherever possible, she schedules these meetings at quieter times of the year – so clients have time to talk. Another common habit is to send a birthday card with no handwritten note or personal details. Everyone’s savvy enough to realise this was automated, or handed over to your PA. It doesn’t feel personal, so it doesn’t build a relationship for you. Gifting is often an afterthought, but in actual fact, it represents a real opportunity to make a difference in your corporate and business relationships. That’s especially true when you work with high-ticket items. Bev quoted real estate and luxury cars as examples. When people are spending thousands or millions of dollars with you, a bottle of wine just doesn’t cut it. If you deliver an ongoing service (home or office cleaning, accounting, car maintenance etc), then this is a good time to thank your clients. So we all tend to give gifts at Christmas. But how do you do it right? Year-round gifting on completion of projects. For example, selling a house, financing major assets, completing an office move or fit-out and so on. This option was so meaty we covered it in a separate post. Many of you are probably thinking about that now – the season’s getting closer and closer! So how can you make Christmas gifts work for your business? Consider any rules and policies which may make it difficult for your clients to accept gifts. In some cases this can be overcome by sending the gift to ‘John and team’ or ‘Jenny and the office staff’, then it’s clearly meant to share. This reduces the risk of being seen as bribing or currying favour. Send gifts to an office address. That way, it’s more likely that people will see the gift, ask, ‘Who’s that from?’ This increases the opportunity to build your company profile and exposure. Ensure your gifts are one of the very first gifts to arrive, in late November or early December. Your company not only looks organized, but your gift will stand out from the crowd. Avoid chocolate gifts as far as possible – they melt. What if you’re on a budget? One final tip for anybody on a budget. If you can’t afford to give quality gifts to everybody, then just focus on the top 20% of your clientele. If you are not able to gift appropriately, it is better not to gift at all. Some clients may miss out for now. Work out which clients are most important to you and who is most likely to refer you to another great client and gift these clients now. In other words, focus your effort, and your investment in business gifts, where it will have most impact. Make sure your gift always showcases your business in a good light! Happy gifting everyone. I hope some of this helps. And if you like the gifts shown here or want other ideas, just get in touch with Bev at Ladybird Gifts!